Red River College is proud to announce the latest recipients of its Distinguished Graduate Award: husband and wife Stu and Heather Charles, both graduates of RRC’s Computer Analyst/Programmer program, now known as Business Information Technology (BIT). 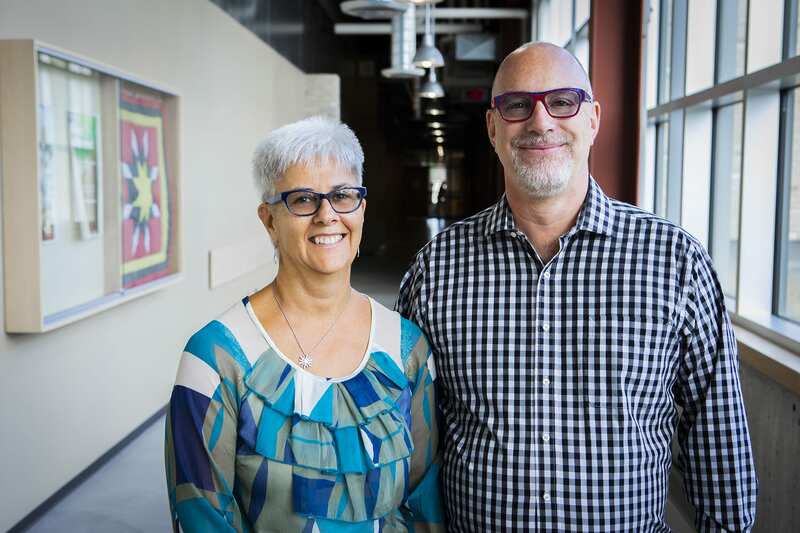 The pair will be honoured by the College and their peers at the upcoming BIT 50thAnniversary Gala, a celebration of a half-century of information technology training at RRC taking place Sat., Nov. 3, at the Club Regent Event Centre. “We are very proud to honour Stu and Heather, two successful and very deserving recipients who now join the ranks of such notable graduates as national news anchor Dawna Friesen, entrepreneur and philanthropist Bob Tallman, and WWE superstar Chris Jericho,” says RRC President Paul Vogt. Stu and Heather met at RRC back in 1977, when both were enrolled in the CAP program. They shared an immediate interest in the then-burgeoning field of computer programming and communicating with computers. “Red River College is where it all started for us,” says Heather. “It was a place that gave us our first opportunity to enter into a new and emerging field and meet 75 like-minded people who were interested in learning more about computers. After graduating, both Heather and Stu went on to successful careers, rising through the ranks of the IT field while serving as longstanding members of the College’s advisory committees, and establishing paid co-op opportunities for students at their places of work. Stu spent the last 17 years as Chief Information Officer at the Workers Compensation Board, while Heather’s career included stints in HR and application development at Manitoba Public Insurance, and as manager of the project management career centre and software developers career centre at Great-West Life. Carrying on with the family tradition, their daughter, Nyssa Charles, also graduated from BIT in 2012, with a major in application development. Today, Heather is still involved with the College as a Project Management instructor, and Stu was recently appointed as one of the newest members of RRC’s Board of Governors. “As a student, employer, advisory member, and now, board member, I have always admired the nimble and responsive approach that Red River College takes to deliver the programs and graduates that industry needs,” says Stu. The BIT 50thAnniversary Gala and reunion takes place on Sat., Nov. 3. Tickets are now available for purchase.